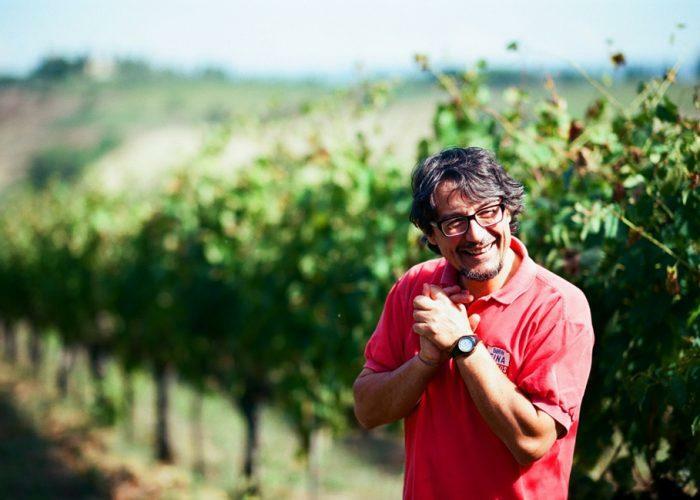 Simone Santini enjoys nothing more than a good joke, though he is very serious about winemaking at his small estate, located near the famous town of San Gimignano. Le Calcinaie is one of San Gimignano's youngest wineries. It was founded in 1987 by Santini and in less than no time he transformed it into one of the region's best newcomers. He started with 6 hectares but has now grown to 12 hectares covered with vines. The vines have perfect exposure and are beautifully tended. Classic Vernaccia with good structure, balance and charm is produced here, as well as a great-value Chianti. Vineyard Practices: This winery is certified Organic by ICEA: The Italian Institute for Ethical and Environmental Certification. Antonio Galloni 90 "Le Calcinaie's 2012 Vernaccia di San Gimignano is delicious. Lemon, crushed rocks, flowers and almonds form a gorgeous mosaic of aromas and flavors in a crisp, beautifully delineated wine loaded with personality. The 2012 is ideally best enjoyed over the next year or two."